I've seen Mu Daiko, the taiko drumming ensemble of Mu Performing Arts, perform at various events (including the recent benefit concert TC Theatre Artists Support Japan), but I'd never seen a full concert performance. Until last night, that is. 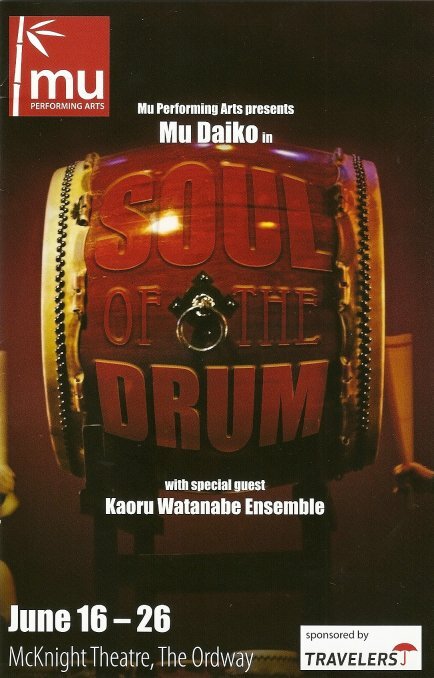 I attended Soul of the Drum, a joint performance with the Kaoru Watanabe ensemble from New York, at the Ordway McKnight Theatre. Mu Daiko, led by Artistic Director Iris Shiraishi, performs with such power and energy and joy (I particularly like the expression of sheer joy on Jennifer Weir's face). It's truly thrilling to watch them. There's something about drums that's more than just rhythm and music, it gets into your body to the point where it feels like your heart is beating in time with the drums. It's a visceral experience. The first act consists of six pieces, all composed by Mu Daiko members. Some include singing or flute music, and all include great rhythms. The drums range in size from small to massive, as do the drumsticks. In my favorite piece, eight drums are arranged in two concentric circles, and the drummers dance among them and travel around each other and the drums with intricate choreography. (I wonder how many injuries were incurred in learning this piece!) Mu Daiko members (I counted ten onstage in some of the pieces) aren't just drummers and musicians, they're dancers. The Kaoru Watanabe ensemble performed in the second act of the show. Kaoru is an amazing and powerful drummer and flute player. I have to admit, I didn't get some of what they did. But I recognize it as the work of artists, and I appreciate that. A dancer named Tamango performed in some of the pieces, including the most amazing solo tap dance I've ever seen. I've never seen feet move that fast. If you ever get the chance to see Mu Daiko perform, take it. And if you're really adventurous, you can even take taiko classes from them! They make it look effortless (which I'm sure it's not) and fun (which I'm sure it is).